Profore Lite Multi Layer Compression Dressing Bandage System from HealthyKin.com is a multi-layer, reduced-compression bandage system. 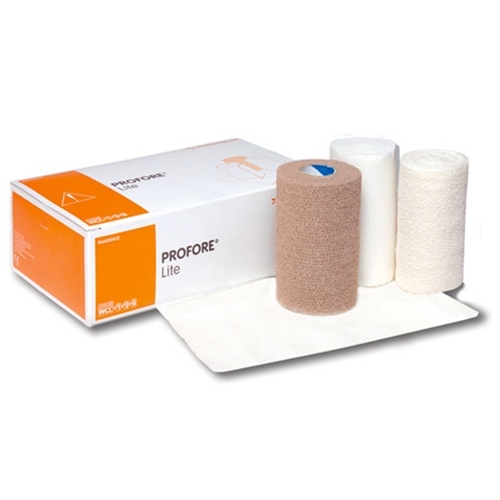 Profore Lite is best used on ankle circumferences greater than 18cm or 7¼ inches (padded). The Profore Lite system is designed to deliver effective compression to successfully manage "mixed" aetiology leg ulcers. It may also be used to manage venous ulcers in patients with ABPIs between 0.6 and 0.8 who cannot tolerate the full compression of standard Profore or Profore LF. The bandages arrived at my home very quickly. Very happy with the service provided. Product is exactly what was ordered. I will definitely use this company again in the near future. Great product. Works very well. Excellent service. The ordering, the delivery and the price was great. The bandages worked out well for my dad. Thank you again. works well for the intended purpose and the price is good. Fast on delivery. I have always received on the shipment next day. Easily applied, good price, excellent service!